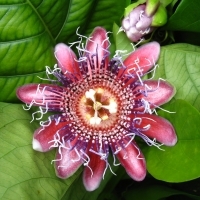 As well known for its striking flowers as for the fruit itself. 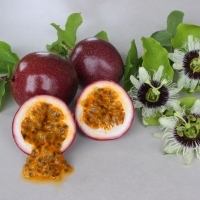 Passion fruit vary from round to oval, purple, red or gold. 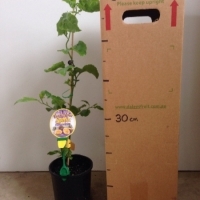 A fast growing vine that usually returns a crop within 18 months of planting. 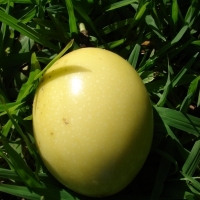 An elongated yellow skinned fruit with sweet pulp. The pinkish flowers are very attractive. Best suited to temperate climates but can be grown in the subtropics with care. 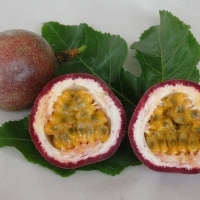 Medium sized, ovaloid fruit, usually with a deep orange skin and white-yellow, extremely juicy pulp. 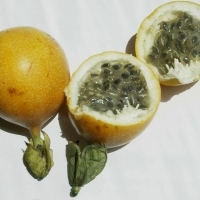 The water lemon has an excellent perfumy-mild taste, without the tartness of the common passion fruit. 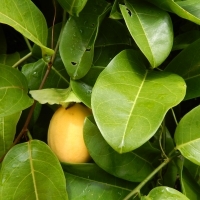 A more tropical variety that has a large golden skinned fruit with a strong flavour. Some selections can be quite acid. 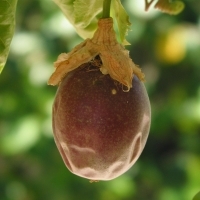 This variety is used as a rootstock for grafted selections due to its disease tolerance and vigor. 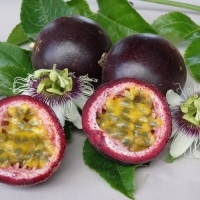 Grafted Pink Skinned passion fruit cropping most of the year. 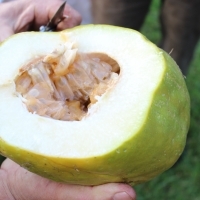 Large with sweet juicy pulp grafted onto Fusarium resistant rootstock. 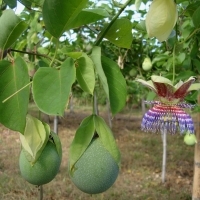 This variety is owned by APIA and cannot be propagated without permission. 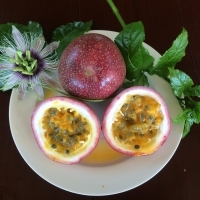 This is a selection from a hand pollinated cross between passiflora alata x quadrangularis , the Giant Granadilla and the Lilikoi. Interesting cross as it has the flavour of the Lilikoi but 2 -3 times larger. 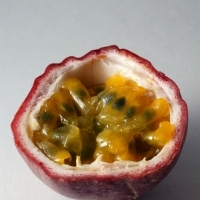 Cross pollination is beneficial for fruit set. Flowers are highly attractive and fragrant. A native to South America. 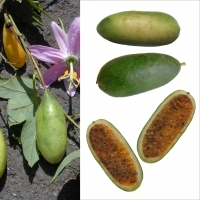 Very similar to P. Ligularis, this vigorous vine produces grape flavoured fruit, with a very hard shell. The flowers are fragrant with purple and white speckled petals. A freak hybrid from Burringbar in northern NSW. 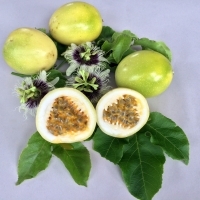 It bears fruit of excellent quality and shows a good degree of tolerance to fungal diseases. 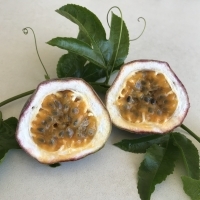 This variety was used in breeding work and has resulted in some promising selections being made, notably the Super Sweet Selections.